Shock advertising uses disturbing images to grab the attention of passerbys and leave a lasting impression. While I don’t think shock advertising is wrong, it is in poor taste. With advertisers all competing for attention trying to use shock to make a product or message stick is very common. Thus, viewers become desensitized to shock advertising. It doesn’t have the impact it once did except on the very young. So advertisers ask yourself, is this really necessary? The above image is a great example of shock advertising. It’s intended to be distressing and make people rethink their meat consumption by equating it with abuse and human life. Their intent is to make the viewer connect the two and stop eating animals. PETA would argue that the shock advertising is worth it if they can convince people. As a viewer of the image, I simply feel irritated with the organization and a strong desire to not join them. Equating human life with cattle comes across as an illogical guilt trip and desperate appeal to my emotions. If non-vegans are their target audience they’ve managed to remind this one why I am quite happily never going to be a vegan. However, these shocking adverts are likely successful in the long run or PETA would stop using them. 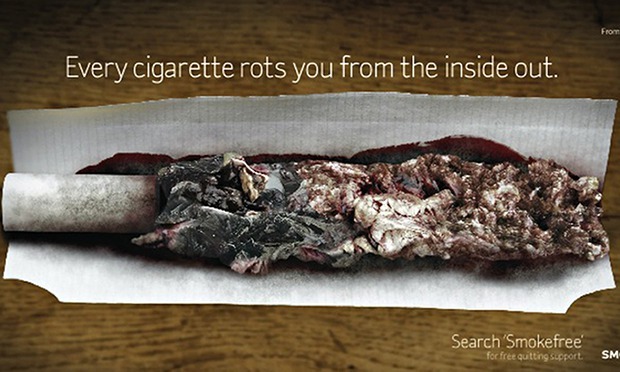 Another example of shock advertising, the image above also used alarming images of decay to drive home a message. This image is in slightly better taste by focusing on the effect of smoking on lungs instead of using something like a decomposing human. The effects of cigarettes are pretty well known at this point so I’m not sure how effective it is in getting viewers to quit but the image could be a trigger to call for more information. The creators of the image would argue that saving a life justifies the disturbing visual. Propaganda describes images or content that is misleading and biased in nature. I don’t see a moral issue with the existence of propaganda in a free society where viewers can find out more and hear other opinions. After all, many things could end up falling under the definition of propaganda, like commercials and election speeches. They are biased and misleading in the information they put out but viewers know it and it’s up to them to find out more information and examine the claims. However, I have different thoughts on state-run propaganda where the press and the people are suppressed. That’s where things become dangerous and viewers are only being fed lies or half truths with no way of finding out the other side of the story. The image above uses powerful imagery and calls the viewer to action. It creates an enemy and a group the viewer is expected to be a part of. However, this movement can be easily researched by viewers where they can decide what to do with the content, if anything. This image also provides links to where people can find more information. The image above I have far more of an issue with. It shows former North Korean dictator Kim Il-sung and the young Kim Jong-il riding with Il-sung’s first wife Kim Jong-suk. The highest point of the Korean peninsula, Mt. Baekdu is pictured in the background and the two leaders ride a white stallion reminiscent of the paintings of great leaders. This work is done in the style of a socialist realism art piece once common in the soviet union. Intended to glorify the “wonderful” leaders and show a gleaming image of their character this image glosses over the difficulties of the citizens. This image bothers me because the citizens lack other information to examine this biased work, likely commissioned by their government.